Get ready for spring in your classroom with this packet of lined spring writing paper. Use the writing paper throughout the spring season. Place it at your writing center for open-ended spring themed writing activities. 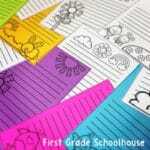 Copy the writing printables onto bright spring colored paper. Your students will love writing notes, letters, and stories on decorated stationery.